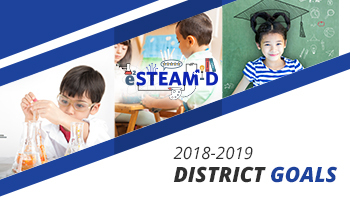 Located in a world-famous destination city, the Anaheim Elementary School District serves approximately 17,000 students at 23 schools and employs more than 2,000 people. AESD’s 22 square mile boundaries include most of Anaheim, Orange County’s largest city. Ideally located halfway between Los Angeles and San Diego, Anaheim is the perfect location to raise a family and enjoy all that Southern California has to offer. We are committed to providing an instructional program where fundamental subjects as well as 21st Century themes such as World Languages, Art and Music, Science, Social Studies, and Civic Engagement are taught and supported in order for our students to become responsible members of society. In 2016, three schools in the Anaheim Elementary School District were awarded the prestigious Gold Ribbon by the California Department of Education. Clara Barton, and Adelaide Price schools were selected for their rigorous academic standards, innovative methods and successful strategies in the classroom. These schools join a list of 14 AESD California Distinguished Schools and three Title I Academic Achieving Schools. To learn more about our unique academic programs, please visit our Distinguished Practices informational page.